Space shuttle Atlantis lands at Edwards Air Force Base in California, completing the final servicing mission to the Hubble Space Telescope, on May 24, 2009. Thisstory was updated at 1:01 p.m. EDT. CAPE CANAVERAL, Fla. - Space shuttle Atlantis landed safely in California on Sunday,bringing home seven triumphant astronauts after their successful service call on the beloved Hubble Space Telescope. 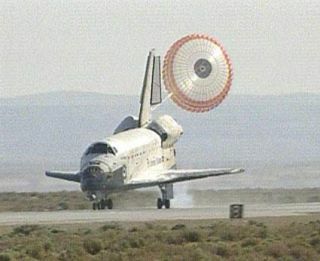 After two days of delay due to storms, the third time was the charm for Atlantis as it touched down on the dry lake bed runway at Edwards Air Force Base at 11:40 a.m.EDT (1540 GMT) to end a 13-day mission to the 19-year-old Hubble. Rainy weather thwarted the shuttle's attempts to land in Florida earlier today and on Friday and Saturday. "Welcome home, Atlantis!" radioed Mission Control. "Congratulations on a very successful mission giving Hubble a new set of eyes that will continue to expand our knowledge of the universe." "Thank you,Houston, it was a thrill from start to finish," Atlantis commander Scott Altman replied. "We've had a great ride. It took a whole team across the country to pull it off, our hats off to you all." Returning to Earth with Altman were pilot Greg C. Johnson and mission specialists Michael Good, Megan McArthur, John Grunsfeld, Michael Massimino and Andrew Feustel. "We're not leaving an aging telescope, we're leaving a newly refurbished telescope," Altman said during a Senate subcommittee hearing Thursday,when - in a first - his crew testified from orbit. "A telescope that is now at the apex of its capabilities, and will be for a long time to come." A pressure glitch in one of Atlantis' auxiliary power units set off an alarm during landing, but was never an issue, mission managers said. Altman and his crew spent just under a week linked with Hubble, where spacewalking astronauts installed two new instruments, replaced aging batteries and gyroscopes, and revived two long-dead instruments that were never designed to be opened, let alone repaired, in space. The result: A rejuvenated Hubble more powerful than ever before, one that is capable of peering back to when the universe, now 13.7 billion years old, was just an ascent 500 million years of age. The space telescope's new instruments and repaired tools should continue its work to probe the structure of the universe,black holes and the existence of dark energy. "This is a 110 percent successful mission," said Dave Leckrone, Hubble's senior project scientist, before landing. "I hope Hubble does well and has a long life ahead of it, and lots of interesting science," said Grunsfeld, a self-described "Hubble hugger" and astrophysicist who made his third trip to Hubble - and fifth career spaceflight - during the mission. Grunsfeld said that humans and Hubble have a storied history together brought to light by flights like this one and the 1993 flight that fixed the telescope's blurry vision due to its flawed mirror. The camera and corrective optics that cleared Hubble's view returned home aboard Atlantis and are destined for the Smithsonian Institute. Atlantis' last mission cost about $1.1 billion to fix Hubble, though nearly $10 billion has been invested in the telescope since its inception and 1990 launch. NASA will have to pay an extra $1.8 million to ferry Atlantis back to its hangar here at the Kennedy Space Center, a process which should take a week and depends on good weather. The shuttle orbited Earth 197 times and flew 5.3 million miles during the trek, which marked NASA's 126th shuttle flight and the 30th mission for Atlantis. NASA plans to fly up to eight more shuttle missions to complete construction of the International Space Station. Atlantis astronauts were hailed this week by the Senate and U.S. President Barack Obama,who personally called the shuttle Wednesday to congratulate the crew on the success at Hubble. Their work was all the more poignant, since it was the fifth - and last - flight to repair and upgrade Hubble before NASA retires its shuttle fleet next year. The shuttle carried an IMAX 3-D camera to record the flight. "When we talk about the Hubble, and giving it essentially a new life, and a new way of going and seeing the universe, you've touched our hearts and you've also made history," Sen.Barbara Mikulski (D-Md. ), who chairs the science appropriations subcommittee, told the astronauts Thursday. She wished them a happy and safe landing. Working in two-man teams, Atlantis' four-man Hubble repair crew persevered through five daunting spacewalks, at times struggling through stuck bolts and other snags which threatened to thwart their attempted fixes. "Every single [spacewalk] to me was a nail-biter," Johnson said. "You should have seen the action out the back window - I was on the edge of my seat." During their spacewalks, Atlantis astronauts installed a powerful new wide-field camera and a super-sensitive spectrograph for studying cosmic structure. They also repaired Hubble's main imager - the Advanced Camera for Surveys - and a versatile spectrograph, which failed in 2007 and 2004, respectively. The astronauts also attached a docking collar on Hubble that will allow a future robotic vehicle to latch on sometime after 2020 and send it plunging into the Pacific Ocean once its mission ends. Atlantis' final flight to help Hubble launched on May 11, but almost never was. NASA initially canceled the flight in 2004 in the wake of the Columbia shuttle disaster that killed seven astronauts because of its risk. The mission was resurrected in 2006, but by then NASA had a plan. Unlike missions to the International Space Station, where astronauts can take refuge if their shuttle is damaged, Atlantis had no such safety net. Hubble flies higher and in a different orbit, putting the safe haven of the station beyond reach of Atlantis' crew. Hubble also flies 350 miles (563 km) above Earth, where the levels of space junk and chances of serious damage are higher than at the 220-mile (354-km) high space station. NASA's solution: a second space shuttle - Endeavour - which stood ready atop a launchpad throughout the mission, primed to launch a rescue flight if needed. The precaution was never needed and NASA released Endeavour from its rescue ship status on Thursday. Atlantis astronauts said there was never a question; fixing Hubble was worth the risk. "Hubble really has struck a fundamental cord in human hearts around the world,"Grunsfeld said. "It's probably the most significant science instrument of all time in terms of its productivity. Astronomers try to use Hubble to answer fundamental questions that we've had since the beginning of human history." Those astronomers, Hubble managers said, are chomping at the bit to use the telescope's new instruments. The telescope is expected to resume science observations in late summer after a rigorous checkout period. "This mission was filled with a lot of mixed emotions ranging from significant worry and anguish to absolute elation," Leckrone said. "So I think I'm going to need a significant recovery or cooling off period. I'll carry this away with me for the rest of my life." Space.com is providing continuous coverage of NASA's last mission to the Hubble SpaceTelescope with senior editor Tariq Malik in Cape Canaveral, Fla., and reporter Clara Moskowitz in New York.